"CT Scan of Dale Mahalko's brain-skull" by Dale Mahalko via Wikimedia Commons is licensed under the Creative Commons Attribution-Share Alike 3.0 Unported license. These findings are described in the article entitled ’The Dark Matter of the Brain“, recently published in the journal Brain Structure and Functions. This work was conducted by Saak V. Ovsepian, who is the Head of the Department of Experimental Neurobiology at the National Institute of Mental Health, Klecany, Czech Republic. There is always more there than the eye can see. Or is there? A revolutionary chapter in the history of science was hallmarked by Galileo Galilei in 1610, looking up at the night sky through a simple telescope of his own making. What he discovered then would forever change the field of astronomy and science in general, transforming our views of the Universe and our place in it. Through the help of a simple but powerful technological leap, Galileo made several revolutionary discoveries, which include the rough landscapes of the Moon, the satellites of Jupiter and, most importantly, the vastness of space and countless constellations of stars extending beyond those observable by the naked eye. In those remote days, Galileo did not suspect that the vastness of unknown and intangible space, in addition to visible celestial bodies and dust, concealed infinite amounts of invisible matter, dubbed in our days as “the dark matter” of the Universe. Almost four centuries later, advances in genetics and particularly in gene sequencing technologies have prompted another scientific breakthrough, but this time in molecular biology. In 2003, the completion of the Human Genome Project, which revealed all ~3 billion base pairs in the human genome, prompted a surprising realization that only a small percentage of DNA accounts for the entire protein-coding makeup of humans. The rest of the genomic material was nicknamed by molecular biologists, in resemblance to cosmologists, as “the dark matter” of the genome, which constitutes as much as ~98% of the entire genetic fabric. Assumed at first to be an evolutionary leftover of DNA lingering throughout natural history in a dormant and fragmented state, the non-coding genome was subsequently shown to conceal splintered chronicles of life’s history along with a wealth of regulatory elements, capable of fine-tuning the activity of certain genes and gene clusters and influencing a wide range of processes and functions. Parts of obsolescent instructions retained in non-coding DNA sequences can, in fact, occasionally re-emerge in one form or another, and manifests through reactivation of rudimentary ancestral features or relict traits. These discoveries suggest that throughout the evolutionary process, large quantities of genetic records that have disappeared from the scene are still kept in a latent state, capable of coming back to influence life affairs. 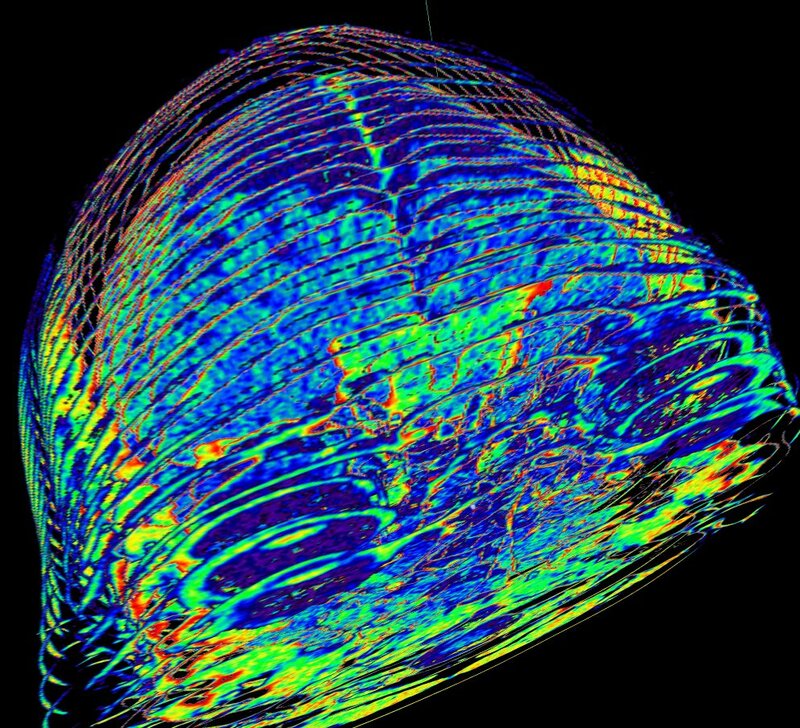 Similar to cosmology and genomic research, advances in functional brain imaging have been highly contingent on the arrival of cutting-edge technologies and research tools. The glorious tradition of functional brain studies set by Hans Berger, Charles Sherrington, Graham Brown, and others prompted major breakthroughs, which climaxed in the arrival of innovative methods enabling visualization of intrinsic and task-driven changes in brain activity and metabolism. The gold standard here has been relating selected brain structures to specific neural functions to gain necessary information for elucidating normal and diseased brain activity and assisting in diagnostics of neurological and psychiatric disease. Like in cosmology and genomic studies, the explosive advances in neuroscience research and imaging methods have unveiled the dark side of functional models of the brain. In particular, analysis of energy consumption changes related with brain activity showed that baseline expenditure of calories at rest is remarkably stable, with extra energy required for processing environmental inputs comprising only a very small percentage (~1%) of the total energy usage. While the general notion is that the bulk of the brain’s energy is allocated for maintenance of intrinsic activity, the nature and functionality of processes absorbing a massive amount of calories remain to be determined. According to Marcus Raichle, who is a world expert in the field, the metabolic state of the brain circuits could be the cause rather than the consequence of neural activity, with the best part of neural energy expenditure remaining unaccounted for. Recent estimates, which are largely based on positron emission tomography (PET) and functional magnetic resonance imaging (fMRI), are especially revealing and propose that with a fierce appetite for glucose and oxygen, the human brain, which constitutes only ~2 % of our body weight, consumes over ~20% of our total body energy. The mechanistic analysis of this intriguing phenomenon is currently hindered by limited sensitivity and resolution of non-invasive imaging methods, which, despite major improvements, remain indirect and crude sensors of neuronal mass action, unable even to distinguish basic neurobiological processes such as excitation and inhibition. Remarkably, hemodynamic measurements combined with autoradiography studies showed that similar to excitation, inhibition can be associated with increased perfusion of neural tissue and rise in metabolic activity, although these effects can vary depending on the experimental paradigm, partly owing to effects GABA on micro-vessel dynamics. Despite the results of cost-based analysis suggesting greater significance of perpetual intrinsic as opposed to evoked brain activity, single-unit electrophysiological recordings and cellular resolution imaging in animal models show that the overwhelming majority of neurons (60-90 %) in anesthetized and awake animals are permanently silent (i.e. do not fire action potentials) or show extremely sparse firing. These findings not only prompt questions concerning the share of inactive neurons in general brain energy expenditure, but also their neurochemical identity, phylogenetic origin, and place in functional brain models. 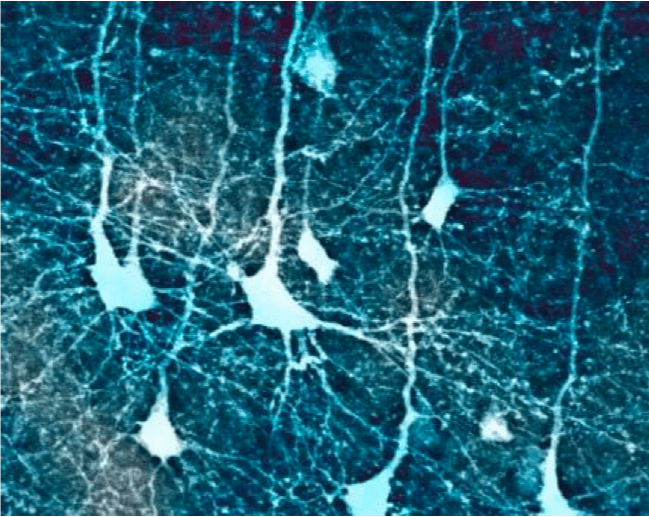 Confocal microscopic image of cortical pyramidal neurons in a mouse brain (from author’s data). Image courtesy Saak V. Ovsepian. In the upcoming article published in Brain Structure and Functions (Springer), I consider the emerging evidence suggesting that vast numbers of inactive neurons documented with electrophysiology and imaging methods are not a result of experimental intervention but reflect the generic state of neurons and brain affairs. I discuss numerous evidence implying that throughout evolution, these vast collections of neurons and circuits could emerge as a result of the trade-off for high conservation of neural evolution, through a selection of loss of function, which facilitated retention of vast collections of dormant neurons in a permanently inhibited state. I review numerous remarkable examples from ethology, neurology, and psychiatry suggesting the possibility of reactivation of silent neurons and circuits by pathological and experimental disinhibition, with their entry into the realm of psyche and behavior, producing an array of neutral or maladaptive fits as well as relict behaviors. Finally, I proposed that the massive collection of neural circuits neutralized by persistent inhibition can afford considerable reserves for neural plasticity and neo-functionalization, with invigorating or disruptive consequence. For further reading, see: (DOI: 10.1007/s00429-019-01835-7).